Christabel Pankhurst: ‘Irishmen did not fully appreciate their women folk’. At a time of feverish debate about Home Rule, and noisy Sinn Féin meetings, the fact that Christabel Pankhurst addressed a well attended meeting in Galway’s Town Hall on October 21 1911 was an important event in the political history of the town. Christabel was the daughter of the British suffrage movement leader Emmeline, and her radical socialist father Richard Pankhurst. American historian Nancy E Rupprecht described her as an ‘almost textbook illustration of the first child born to a middle-class family. In childhood, as well as adulthood, she was beautiful, intelligent, graceful, confident, charming and charismatic.’ She was also a bit of a snob. As a young adult she flung herself into her mother’s Women’s Social and Political Union (WSPU ) the leading militant, women-only, organisation campaigning for women’s suffrage in the UK. Its membership and policies were tightly controlled by the Pankhurst women. It achieved notoriety through its hunger-strikes and forced feeding, for breaking windows in prominent buildings and for night-time arson of unoccupied buildings and churches. The extreme campaigner Emily Davison, who had been arrested numerous times, and force-fed, even when she was ill, died after throwing herself under King George Vs horse, Anmer, during the Epsom Derby in June 1913. As a young adult Christabel interrupted political meetings, was arrested and imprisoned, went on hunger-strike, and was force-fed several times. After obtaining a law degree, she was appointed organising secretary of the WSPU, and was nicknamed by the press the ‘Queen of the Mob’. The Pankhursts were controversial. Christabel and her sister Sylvia did not get along. Sylvia was against turning the WSPU towards solely upper, and middle-class, women using military tactics; while Christabel thought this was the only direction to go. Sylvia wanted to involve working-class women, who were generally harshly treated in the workplace, and by marriage laws. Women had little protection in the law in abuse and mistreatment cases. Sylvia argued that women, because they had no vote, had no power to redress their situation. Christabel, furious at being contradicted, had Sylvia expelled from the organisation. 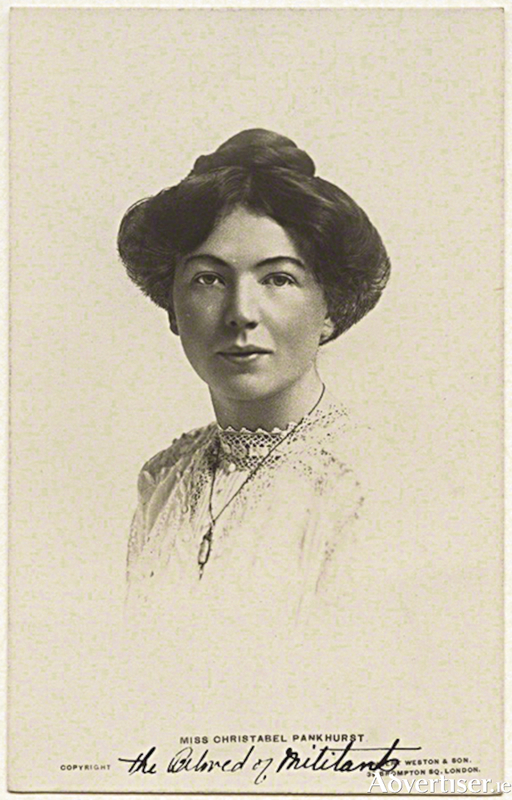 Christabel Pankhurst, in a lengthy speech, told her Galway audience that during the summer of 1911 she had spent two months in Connemara. She saw women there saving turf and hay, and corn, in fact doing all sorts of work…even taking care of the money (This brought laughter and applause, according the The Galway Express ). ‘Now these were things that women got no chance of doing in the cities and towns but in the country women were treated on exactly the same terms as men. Now if in daily life that equality existed why were not the laws (to vote ) brought up to date and into line, with the actual lives of women.’ She pointed that when girls were forced to emigrate because of hardship at home, they sent back money they earned abroad to help with their family’s expenses. Women had the vote in some states in America, she said. If Irish women were competent to vote in these states when they went there, why could they not vote if they stayed at home? The Connacht Women’s Franchise League was established after the meeting. NOTES: *The make up of the Galway audience was the result of a lack of educational opportunities for all women, until the end of the first decade of the 20 century. By 1911 change was well on the way. Women who graduated from the Royal University had generally attended Protestant schools, as the Catholic Church viewed girl’s education as the preserve of the religious orders. Higher education was a male issue. But some girl’s schools, including the Dominican convent school in Galway, began to organise classes and ‘women’s colleges’, to prepare young women for Royal University examinations. In 1904, Trinity College announced it was admitting women students, which allowed women to apply direct for a Trinity education. In 1908, thanks to the progressive policies of chief secretary for Ireland, Augistine Birrell, the University Act established two universities, Queen’s University, Belfast, and the National University with its three constituent colleges in Dublin, Cork and Galway. This gave women total equality with men, not only in teaching but also in the appointment of teaching staff. (‘Women and Education’ from Margaret Ward’s Hanna Sheehy Skeffington, published University College Dublin, 2017 ). References include Mary Clancy’s Women of the West - Campaigning for the vote, from Irish Women and the Vote, Irish Academic Press (revised ) 2018, Google, The Galway Express. - Galway’s Urban District Council was one of the first local authorities to pass a resolution in support of the House of Commons Conciliation Bill 1911 - which was a sop to the Suffrage movement by promising to allow women to vote providing they were very wealthy, property-owning, people. The Bill was eventually lost because it was inadequate, distrusted, and finally scotched in the belief that if passed women would for ever vote Conservative. Nevertheless, Galway UDC felt it was a step in the right direction, and cheered it on. - The biggest bugbear for women’s suffrage in Ireland, was the out and out antipathy by John Redmond, leader of the Irish Parliamentary Party which was guiding the Home Rule Bill through parliament. He had absolutely no time for women’s suffrage, and saw no reason to include it in the new Ireland he had envisaged. Ironically votes for women, albeit in a limited form, was the gift of the House of Commons in 1918. Only women over the age of 30, householders, or owning rented property, and university graduates were allowed to vote. That was extended to all women over 21 years of age in 1928. In Ireland, however, things had changed dramatically. Following Ireland’s separation from Britain, the promise of equal rights for women, as stated in the Proclamation, was granted in 1922, six years before similar rights were given in Britain. How could ‘hysterical’ women be allowed to vote? Why did Robert Gregory reach for the sky? Drinking German tea, and other stories from South Galway. Page generated in 0.1430 seconds.